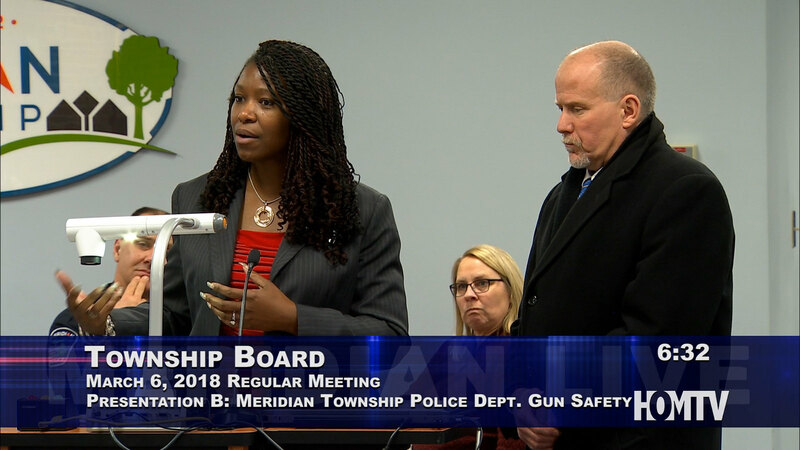 MERIDIAN TOWNSHIP - At the Meridian Township Board Meeting on Tuesday, March 6th, Assistant Chief Ken Plaga gave a presentation about Gun Safety in Meridian Township public and private schools. Plaga addressed training, equipment, planning, best practices, and partnerships that the Meridian Township Police Department works to foster when it comes to active shooter situations in schools. He stressed the training and practice that Haslett and Okemos schools go through on a yearly basis, and how he was consistently impressed with how quiet students could be during active shooter drills. The plans are revised and updated as more information and recommendations become available. Also addressed in Plaga's presentation were the school resource officers that are assigned to each high school and the benefit that they bring to the community. "We provide an officer dedicated to each district so we have a point of contact for any questions or concerns or things that might come up. And one of the most important things that's come up in the last few instances we've had is really getting those kids comfortable with saying something to parents, teachers, preventing anything from happening," Plaga stated. After Plaga finished addressing his points, Superintendent Alena Zachary-Ross of the Okemos School District and Superintendent Steve Cook of the Haslett School District both spoke to the Board. Superintendent Cook spoke first about how they are keeping lines of communication open with the police department and updating their plans for any emergencies, "We try to stay in contact with residents of our district and our school to make sure that everybody is on the same page to know what we're doing with our school. We feel pretty comfortable with where we're going, but we always can improve." Superintendent Zachary-Ross talked about the district response plan that her district is in the process of creating, "We are working on that along with some other persons, like mental health experts because a lot of this, as [Plaga] talked about building relationships, has to do with the relationship." Both Superintendents were happy with the relationship that they are building with the Meridian Police Department and both are working to address mental health within their schools. Okemos had a mental health assembly for their students on March 7, 2018 and will host a community event in April to give parents and families a way to address or learn about any concerns that they may have. Haslett has the program Okay2Say through the state of Michigan that gives students a way to text or call if they feel unsafe or threatened, along with a team of mental health experts.